Last winter, 60 inches of snow had fallen on Boston by this point in time. Snow plowing contractors aren’t very happy this season…but, I’m OK with the 8 inches we’ve had so far. This brings to mind the usual spring thaw and runoff. So let’s talk Rain Gardens. 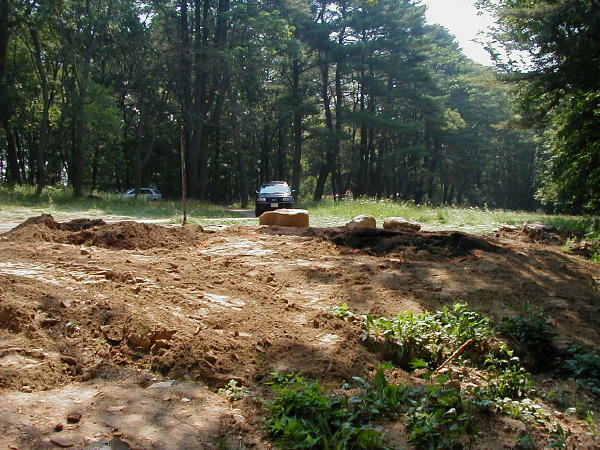 Hard to believe it’s been 22 years since the first Rain Garden was built in the state of Maryland to replicate the natural bio-retention systems that had disappeared with the development of the land. But lucky for us, guidelines were developed and monitoring over the years led to improved designs of these plant systems for infiltration and bio-retention of stormwater runoff. In recent years, many states and towns have adopted Stormwater Regulations and Bylaws to limit and monitor pre-existing and future connections to Municipal Storm Sewer Systems. In an effort to control pollutants, flow amounts and soil erosion – industry, commercial and residential discharge connections to the Municipal Storm Sewer System (MS4) must now be permitted. My town, Ipswich, MA, has issued an official notice (to residents, businesses and developers) with a compliance schedule to be met within 4 years. Rain Gardens are one of many Low Impact Development techniques (LID) that can be implemented for stormwater management. Not only are Rain Gardens adding beauty to cities, towns and neighborhoods, they are environmentally friendly, an alternative to concrete drywells, and are now considered an acceptable “lot drainage system” in connection to the MS4. 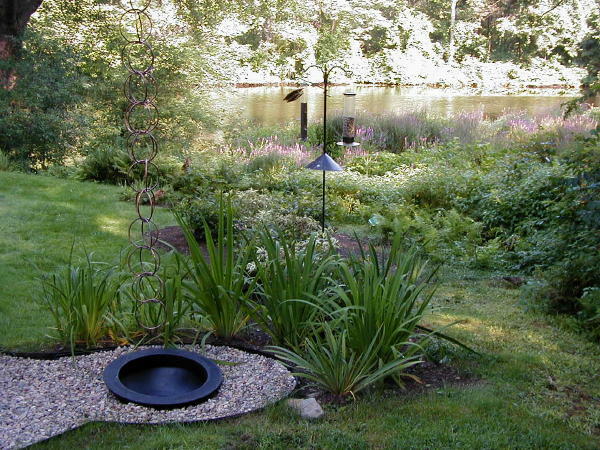 My first Rain Garden project, back in 2007, was designed for the Ipswich River Watershed Association (IRWA) at their headquarters at Riverbend. Working with the IRWA staff, interns, volunteers and contractor, we installed a Double Rain Garden. 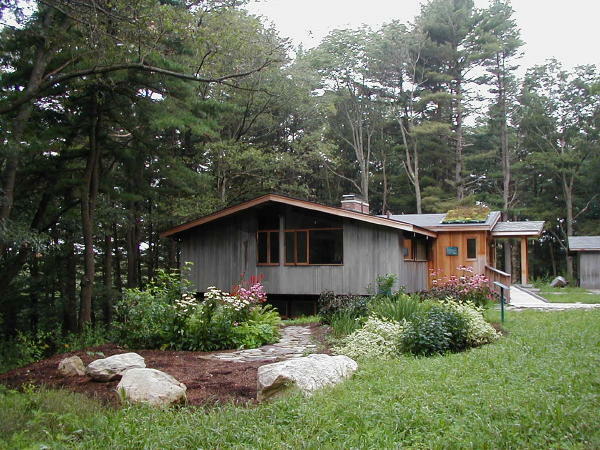 Its size was calculated to handle the amount of water flow from the building roof, access ramp, parking area and driveway and to filter out chemicals and pollutants before the water flowed into the Ipswich River, located downhill from the building and Rain Garden. 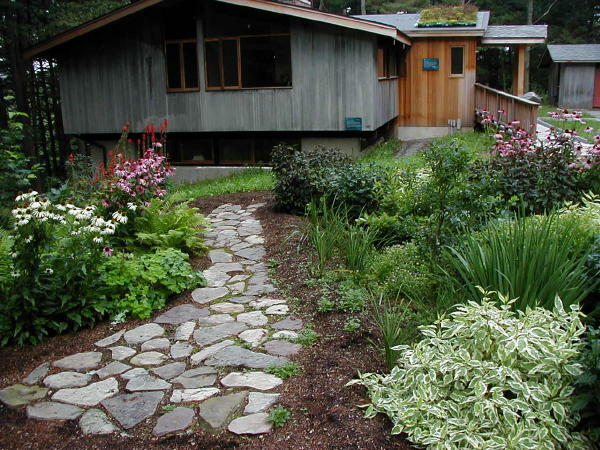 Maintenance of a Rain Garden is similar to any garden. 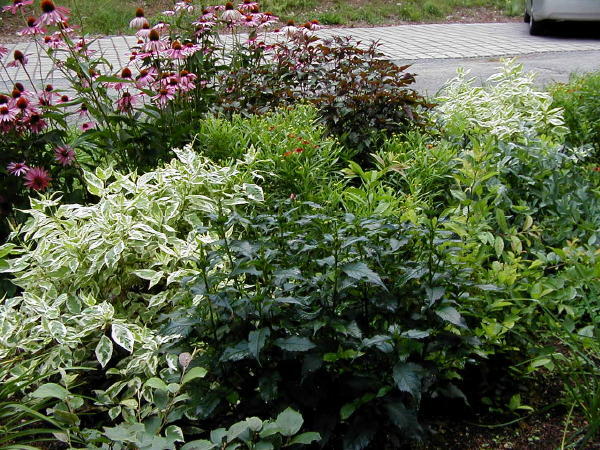 Some initial watering is required to establish the planting, depending on rainfall. Weeding on a regular basis keeps the plants thriving, limits competition and is required for keeping out invasive species. 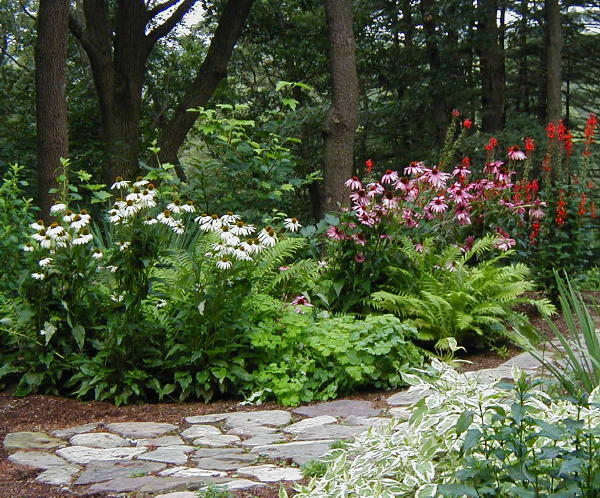 Dividing perennials is typically required the 3rd or 4th year after planting. IRWA staff and Volunteers have always helped maintain the Native Plant, Demonstration and Rain Gardens at IRWA. 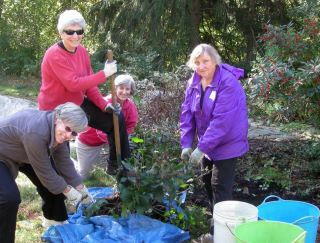 Last fall they helped divide perennials and ferns in the Rain Garden to maintain the integrety of the original design. Another residential project included a Rain Garden in a backyard bordering the Ipswich River on a neighboring street from mine. 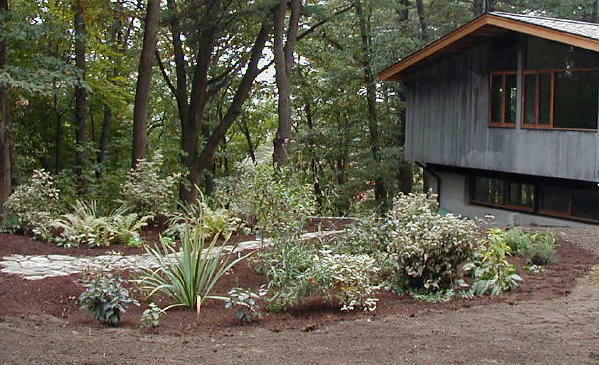 The positon and shape of the Rain Garden was critical to capture water flowing over the sloped grade behind the car port and from half of the house roof using Rain Chains the homeowner had connected to the gutters. 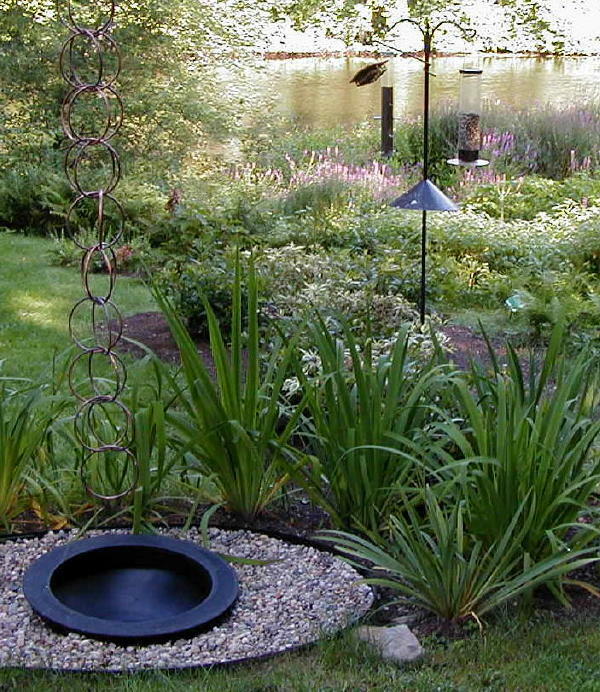 The plants selected are a magnet for butterflys, dragonflys, and birds from the adjacent river habitat. Both Rain Garden projects were located within the wetland buffer of the river, necessitating the use of native plant materials. As most natives are tolerant of both wet and dry growing conditions and attract wild life, they are ideal for a Rain Garden habitat. Local Conservation Commissions are very receptive to installing Rain Gardens, whenever possible, as a solution to water management on an appropriate site. If a natural depression occurs in your yard, a Rain Garden could be the ideal solution for a faster rate of water absorption in that area. This entry was posted in Landscape Design, Native Plants, Rain Gardens, Stormwater Management and tagged Landscape Design, Native Plants, Rain Gardens, Stormwater Management, Stormwater Management Solutions. Bookmark the permalink. This is an informative and insightful blog post. Great job! I thoroughly enjoyed reading it. Beautiful work Denise. I love the garden next to the river, spectacular. Really inspiring. The pictures of both projects, which I have seen, are amazing. Both gardens have also held up so well over time, getting better as they grow and mature. Your photography enhances your blog posts so much. Thanks, Denise. Appreciate your feedback on the gardens and the blog posting. It’s gratifying to know that these gardens are thriving as Eco-systems that benefit the Ipswich River and beyond.